Howard Kent Walker is a military veteran, diplomat, and educator who was born on December 3, 1935 in Newport News, Virginia. His father was a high school chemistry and mathematics teacher and his mother a homemaker. Upon graduation from high school Walker enrolled at the University of Michigan in Ann Arbor, Michigan where he studied until 1958. During his time in Ann Arbor Walker eventually majored in political science and was also part of the Air Force Reserve Officer Training Corps (ROTC), which meant he would have a three-year obligation to the U.S. Air Force after graduation, which he fulfilled (1962-1965). After his military service and a brief stint as an analyst at the Central Intelligence Agency (CIA), Walker passed the Foreign Service exam, becoming a Foreign Service Officer in 1969. His first assignment was in the U.S. State Department’s Bureau of Inter-Africa Affairs, working on Africa-United Nations issues. Walker’s first overseas assignment was at the U.S. Embassy in Lagos, Nigeria (1971-1973). He returned to Washington, D.C. to serve as an International Relations Officer for West African Affairs (1973-1975). He then was assigned as a Counselor for Political Affairs at the U.S. Embassy in Amman, Jordan (1975-1977) and next to the Embassy in Dar Es Salaam, Tanzania (1977-1979) where he served as Deputy Chief of Mission, the second in charge of the embassy. From 1979 to 1981 he held the same position in Pretoria, South Africa. 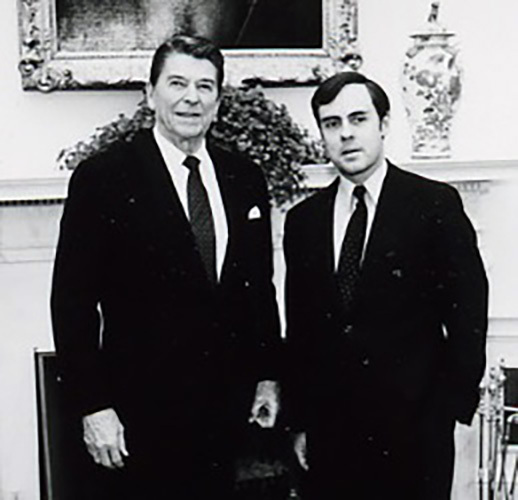 In 1982, President Ronald Reagan appointed Walker to be U.S. Ambassador to Togo, where he served until 1984. During his time in Togo, one of Ambassador Walker’s main assignments was in persuading the tiny West African country, which now held a non-permanent seat on the United Nation’s Security Council, to support U.S. policy interests against the Soviet Union during the final decade of the Cold War. After Togo, Ambassador Walker became a Foreign Affairs Fellow at the Foreign Service Institute (1984-1985), and then Director of the Office of West African Affairs (1985-1987). He next served in the Office of the Inspector General at the State Department for two years (1987-1989) until President George H.W. Bush appointed him as his Ambassador to Madagascar and the Comoros in 1989. He would hold that post until 1992. While there he laid the groundwork for the first Peace Corps volunteers to work in Madagascar. The first ten volunteers arrived in 1993, a year after Ambassador Walker’s departure. From 1992 to 1994 Ambassador Walker served as the State Department’s senior representative and Vice President at The National Defense University in Washington, D.C. There he led efforts to ensure that America’s future military leaders understood the diplomatic dimensions of military action. After retiring from the Foreign Service in 1994, Ambassador Walker became Deputy Commandant of The North Atlantic Treaty Organization (NATO) Defense College in Rome, Italy, serving there from 1994 to 1997. Here he directed the diplomatic-military curriculum for future military and civilian leaders of this important global alliance. Since that time, Ambassador Walker has returned to teaching international relations at various U.S. universities. Ambassador Walker holds Bachelor’s (1957) and Master’s (1958) degrees from the University of Michigan, as well as a Ph.D. (1968) from Boston University in Massachusetts. Walker is married and the father of two children. Interview with Ambassador Howard K. Walker: Charles Stuart Kennedy, November 11, 2001,The Association for Diplomatic Studies and Training (ADST) Foreign Affairs Oral History Project: http://www.adst.org/OH%20TOCs/Walker,%20Howard%20K.toc.pdf; ADST Country Reader on Togo: http://www.adst.org/Readers/Togo.pdf; American Foreign Service: http://www.afa.org.